It’s known to pop up as a persistent weed in gardens, on lawns and even in driveway cracks. But plantain is one of the most medicinally powerful “nuisance” plants that you probably aren’t taking advantage of for your health, perhaps to your own detriment. Those bushy green leaves and small, stalk-like buds bear unique nutritive potential that could help you overcome difficult menstrual cycles, clear up skin acne and even treat painful arthritis. For hundreds of years, plantain has been used as one of the nature’s most powerful medicines, and for very good reason. 1. Plantain works topically as a wound-healer. “Because it draws toxins from the body with its astringent nature, plantain may be crushed (or chewed) and placed as a poultice directly over the site of bee stings, bug bites, acne, slivers, glass splinters, or rashes,” explains Life Advancer. 2. Plantain aids in healthy digestion. If you suffer from constant digestive problems due to antibiotics, food allergies, or toxins such as herbicides used with GMO crops, plantain might be a simple cure. Many have reported that the leaves and seeds of the plant aid in reducing inflammation and help repair damage to the gut lining. The seeds of plantain are also useful in maintaining a clean digestive tract, acting similarly to psyllium husk in absorbing toxins and creating firmer stools. When steeped, plantain leaves can be turned into an extract for use as a gut healer. 3. Plantain helps treat congestion, respiratory problems. 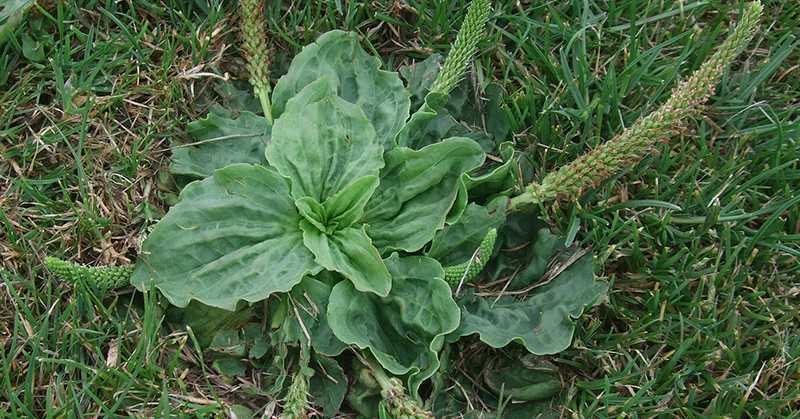 “Plantain acts as a gentle expectorant while soothing inflamed and sore membranes, making it ideal for coughs and mild bronchitis,” wrote David Hoffmann, FNIMH, AHG, in his book Medical Herbalism: The Science and Practice of Herbal Medicine. 4. Plantain helps treat hemorrhoids. The same astringent properties that make plantain an effective wound healer also make it an effective remedy for hemorrhoids. When processed and turned into a lotion or ointment, plantain can be applied to hemorrhoids to stop the flow of blood, which is also useful in the treatment of cystitis accompanied by bleeding. 5. Plantain treats all blood diseases, and nearly all other diseases. Truth be told, there seem to be very few health conditions that plantain can’t treat. According to The American Materia Medica, Therapeutics and Pharmacognosy, written by Dr. Finley Ellingwood, MD, in 1919, plantain is effective against virtually all blood diseases, many glandular diseases, mercury poisoning, diarrheal conditions, female disorders, and injuries, bites, and rashes on the skin. “Plantain is almost a panacea for the human body, treating everything from all menstrual difficulties, all digestive issues, to nearly all skin complaints, and even arthritis,” adds Life Advancer about the incredible healing potential of plantain.